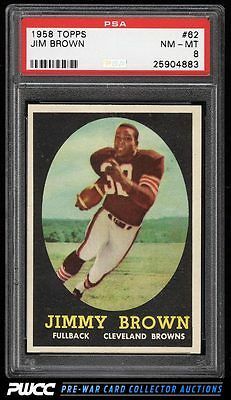 *Auction 7, Vintage Round 2* Among the most important rookies in all of collecting and a must have for the serious Football collector. The offered Brown rookie boasts rock-solid NM-MT corners and card stock. Well centered with crisp edges and nice surfaces. Everything is where it's supposed to be when upholding the PSA assessment. One of nearly 20,000 cards, lots, and sets up for bid in our 7th Auction of 2016. Click on the link above to view the other PWCC auction lots.